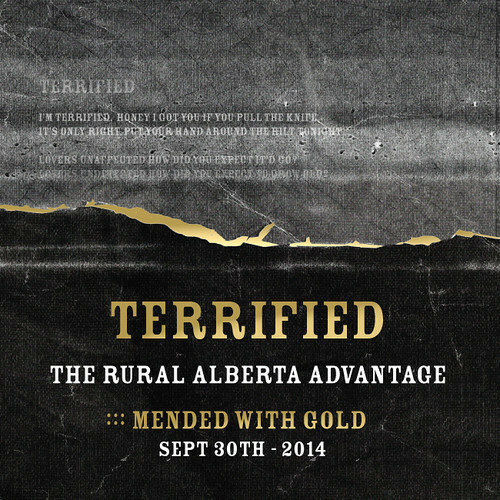 Toronto’s The Rural Alberta Advantage have never seemed to get quite the recognition they deserve but we’re hoping that their new album, Mended With Gold, will do the trick. Their newest single, entitled “Terrified,” should surely set them on the right path. “Terrified” is a monstrous, galloping folk-rock effort that will take you by surprise right from its opening moments. Nils Edenloff’s vocals have always been considered an acquired taste, but I think with artists like Andy Hull transitioning more into the mainstream, listeners will hopefully be more open to accepting his unique voice — which I personally find fantastic, and maybe never more so than in “Terrified.” There’s an undeniable energy and confidence, despite the song’s title, and the dual vocals between Edenloff and Amy Cole are the icing on top of the cake. You can stream the new single after the jump. Mended With Gold is set to release through Saddle Creek on September 30. Pre-orders are available through their store and also through Paper Bag Records.